TAKE A HIKE | NEW Transit to Trail Bus Service to Mount Si! We saw our shadow this morning and you know what that means? That big, bright and shiny glorious ball of flame in the sky☀ is happy and shining! Like most Pacific Northwesterners, when the sun is out, we get a bad case of #FOMO (fear of missing out) and head outside because 1. we love sunshine and 2. we don’t want to feel guilty for staying inside on a nice day. NEW Transit to Trails service. While a lot of us head out to our favorite local outdoor destination, some of us seek quieter places off the beaten path for fresh(er) air and a space less crowded. If you’re like the latter, grab your transit fare (ORCA card, cash, mobile ticket, or transfer), daypack, and boots (there’s room for your bike too!) and try out our new transit to trails Trailhead Direct bus service! Catch the bus at the Mount Baker Transit Center. Service is every 30 minutes. SEE SERVICE SCHEDULE & MAP. Catch the bus at Sound Transit’s Capitol Hill Link light rail station to Mount Si and Mount Teneriffe. There will also be stops for customers in downtown Seattle and at the Eastgate and North Bend park-and-rides. SEE SERVICE SCHEDULE & MAP. Beginning June 16, you’ll be able to board a Trailhead Direct transit van at a free satellite parking lot in North Bend to the Mailbox Peak trailhead. For the 2018 hiking season, Trailhead Direct is expanding by providing transit van service from South Seattle and Capitol Hill to hiking destinations along the I-90 corridor. A Hike Back – The Backstory. 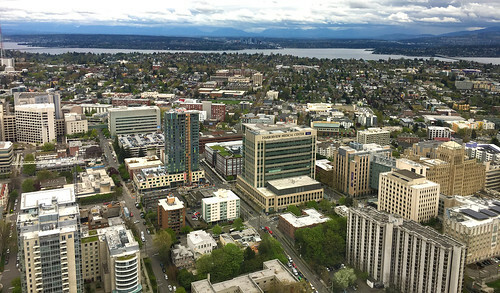 We’ve partnered with King County Metro bus service through the Seattle Transportation Benefit District STBD Regional Partnership program (In 2014, Seattle voters approved Proposition 1 to fund the purchase of increased Metro service and additional transit programs for Seattle residents.) to bring to you a new transit to trails bus service. 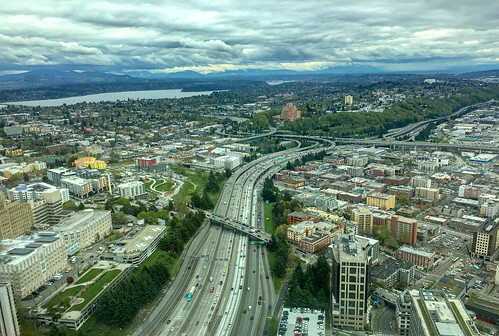 We’re proud to work as a funding partner with Metro to provide increases mobility to attractions in the Seattle region, ease vehicle congestion, reduce safety hazards, and expand access to hiking destinations along I-90. The City has invested in 64 Seattle routes to improve reliability and/or to address overcrowding. 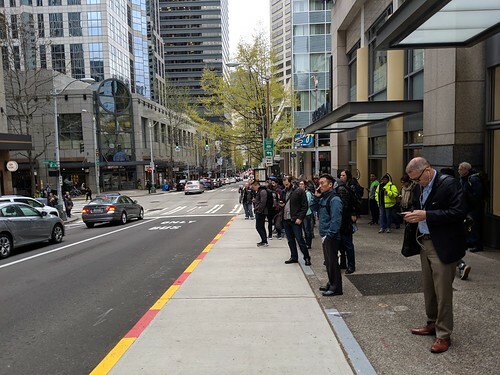 Funding Trailhead Direct builds upon our investments in the Seattle transit network where we’ve been able to improve frequency or reliability on 64 other routes. This program is an opportunity to provide better access for more people to the outdoors. While trail destinations vary in accessibility, Trailhead Direct vehicles are wheelchair accessible so all are welcome! Thanks to Seattle voters, we’re able to directly purchase transit service for Seattle, providing mobility options to explore the Seattle area. Here’re a few shots from our launch of Trailhead Direct from Mt. Baker to Issaquah Alps last Saturday, April 21. Open 6:00 a.m. to 8:00 p.m. – for trip planning and lost & found calls. Open 8:00 a.m. to 5:00 p.m. – for fare/pass information and customer comments. Closed on weekend and holidays. Improving access for all. Curb ramps on Dravus Street. It’s been a year since we launched the Seattle Accessible Route Planner, an online tool that helps travelers, particularly those of us living with disabilities, to navigate the city’s sidewalks, curb ramps, and street crossings. We’ve updated a few thing: added functions, improved its look and feel, and hopefully, made it more user-friendly. So, check it out and let us know what you think! It used to be the City of Seattle Curb Ramp Map and Accessible Route Planner. Yes, that’s a mouthful! Now we call it the Seattle Accessible Route Planner and it has a new online address, too. So if you’ve bookmarked it, please update your Favorites! The original planner used the satellite image of the city. 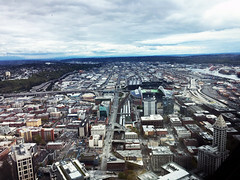 New Seattle Accessible Route Planner view. We updated the map legend. Curb ramps and sidewalks now use solid lines to show what condition they’re in. Orange is used to show how steep a street is. It’s easier to give us feedback. Just click the blue banner at the top – you can Report Data Inconsistencies, make an ADA request or just give us your general feedback, which we really appreciate! The Seattle Accessible Route Planner is updated every day with information that can help people better plan their routes around the city. We hope you’ll take a look, click around, and tell us what you think! For more ADA general information, please visit our website. Cross section of the new protected bike lanes. 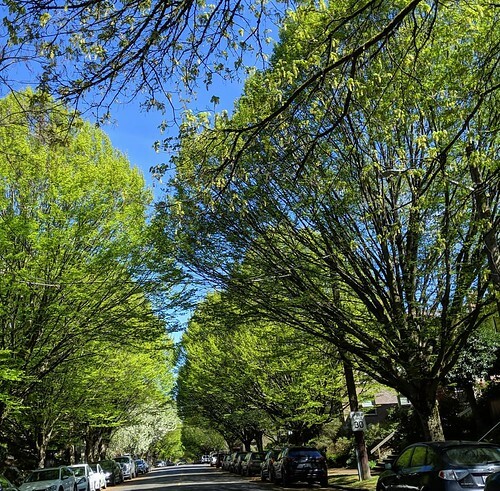 Magnolia will soon be better connected to the citywide bike network with a new protected bike lane (PBL) along Gilman Avenue W, but not without a few bumps (pun intended) along the way. We’ve heard you Magnolia, and we recognize your concerns about the project. Some residents feel the community input process wasn’t thorough. We take community engagement very seriously. As we complete this important bike network infrastructure, we’ll continue to work with any neighbors who have questions or concerns. We worked hard to include community feedback into the design and apologize if neighbors feel their voices haven’t been heard. To receive email on construction updates and provide feedback, contact Dan Anderson, Dan.A.Anderson@Seattle.gov. Traffic backups at the W Emerson Pl and Gilman Ave W intersection. W Dravus St and the Magnolia Bridge farther south. 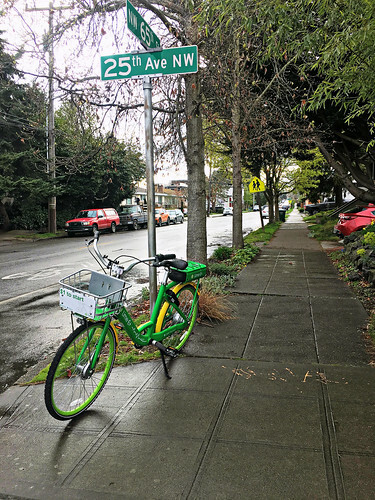 Or if you live or work in north Magnolia, you can take a right at 21st Ave W to W Commodore Way, leading to the Fort St Bridge over the railroad tracks on 27th Ave W.
Bike commuters are frustrated with the setup during the construction phase. We share your frustration. Sometimes the best organized plans have a SNAFU. In this case, delayed delivery of critical materials like posts and hardware have contributed to the delay. But good news! Crews installed posts along the PBL this week, separating cyclists from traffic, and next week new pavement markings will be installed to increase visibility and safety. And coming soon, a new bike signal at W Dravus St will help mitigate confusion by making it more obvious where the lanes are, helping travelers adjust to the new layout. We thank the community for your feedback and patience while the work is completed. We’re committed to monitoring the new street design and intersections both during and after construction to see what’s happening. Check out Seattle Bike Blog’s opinion of the project. Without taking away a car lane, the 1.5-mile route will add a two-way protected bike lane on the west side of the arterial; currently there’s a striped bike/parking lane on both sides of the street that sandwiches cyclists precariously between traffic that’s hurtling along at up to 40 miles-per-hour and occasional parked cars (aka, the “door zone”). Changes won’t only protect cyclists, but by narrowing the existing car lanes, car speeds are expected to drop. Data shows that car speeds on Gilman Ave W often exceed the posted limit and there have been several serious crashes over the years. We looked at available crash data and found that there were 186 reported collisions in the project area over the past 14 years. Six of those crashes injured people. 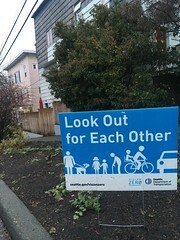 At least four cyclist and pedestrian crashes occurred at both the intersections of 20th Ave W & W Dravus St, and Gilman Ave W & W Emerson St during that time period. Exactly why we’ve focused resources on making safety improvements at both intersections by separating pedestrians and cyclists from car travel lanes. 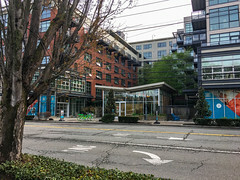 For more project information visit the Interbay Trail Connections Project. We’ve been working with pedestrian advocates on a better understanding of the complexities of traffic signal timing in the city, ever since a local campaign called #GivePedsTheGreen started last spring. The campaign proposes removing pedestrian push buttons in all urban villages. Here’s why that’s not a good idea. We used to have a policy in which pedestrian push buttons were removed in areas with heavy pedestrian traffic – however, that contrasts with our obligation to provide effective communication to people with visual and/or hearing impairments wanting to cross the streets. Because of this obligation under the ADA, we strive to provide that communication using accessible pedestrian signals (APS). Deaf, hard of hearing, blind, and visually impaired pedestrians may rely on these buttons to move freely throughout the city. The signs that go with these signals are required to help that movement. Our ongoing dialogue with pedestrian advocates prompted us to improve our guidance around pedestrian treatments at traffic signals. It’s not a matter of either having them or not having them. The fact is, we need these pedestrian buttons. But we can use them differently depending on the circumstances of each location. Traffic signal technology is constantly improving and that means there are many different treatments our signal engineers are looking at to help improve the pedestrian experience. Passive pedestrian detection – we’re testing thermal imaging to detect pedestrians so that someday, maybe they won’t have to push buttons to be detected. This tech is similar to how vehicles, buses, and bikes are detected at signals. The challenge is that pedestrians are not as predictable as a vehicle, bus or bike in a travel lane. Soundscapes is an amazing example of how new technology could help deaf, hard of hearing, blind, and visually impaired pedestrians navigate a city. We visited researchers at Microsoft who developed a pilot that uses a headset, smartphone, and outdoor beacons to immerse users in an audio-rich environment, to help people with vision loss move with more confidence and independence on city streets. This is a prototype for now. Not all treatments are universal. We have a lot of different tools in our tool box and we look at the specifics of each intersection to determine the right tool to use. As an operational agency we have many different advocates who want us to create a safe and efficient system for vehicles, buses, bikes, pedestrians, and freight. We’re pretty sure that the majority of people can understand that. Our commitment will always be to constantly look for opportunities to improve. Our advocates are a huge piece of that commitment, helping us in the right direction. 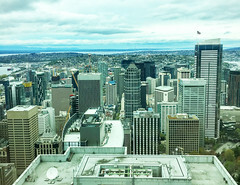 Seattle welcomes Transportation for America and Smart Growth America! We’re touring with Smart Growth America (SGA) and Transportation for Massachusetts this week! Together with Seattle Chamber of Commerce, the tour will focus on our world-class transportation and people-focused projects moving Seattle and finding solutions for transportation challenges facing dynamic and fast-growing cities in America like Massachusetts. Discussions on social equity, environmental sustainability, and economic development will be at the forefront of conversation. We’re also sharing our city’s transportation journey from Bus Rapid Transit (BRT), Vision Zero, protected bike lanes, and being the nation’s first city to pilot dockless bike share to name a few. SDOT is thrilled to work together with our powerhouse of transportation experts and partners at Transportation for America, Transportation for Massachusetts, Puget Sound Regional Council, Transportation Choices Coalition, Sound Transit, Gerding Edlen, Capitol Hill Housing, City of Seattle, King County, WA State, and Vulcan. 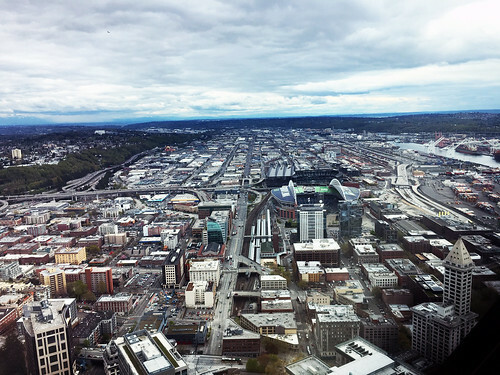 SDOT, other transportation agencies, and accessibility professionals recently got together to learn about and discuss the needs of people living with vision disabilities at the Federal Highway Administration (FHWA) Innovative Street Design and Accessibility Workshop. It was a learning opportunity that included a forum discussion on how street and bike lane design can impact them. For example, did you know that 85% of people who are considered legally blind possess some level of remaining vision? People also had a chance to observe a tactile roadway map with raised features, allowing those with low or no vision to feel proposed street design layouts using their fingertips as they felt across the map. Pretty cool! 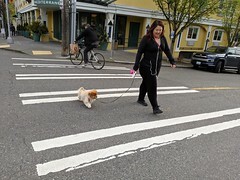 Perhaps the most informative and interesting part of the workshop were the assessments on Seattle sidewalks and streets. The group traveled across the city to get important feedback on street and sidewalk features. Participants with vision impairments commented on different features found along the way, including tactile or raised features on the sidewalk for foot or cane detection, and traffic signal push-button locations. Feedback from this group will be used by the FHWA to produce guidance material that can be shared throughout the country. This will promote consistent design from city to city, which is important so that people living with vision impairments can understand how to navigate and understand the cues provided. The FHWA workshop included attendance by The Seattle Lighthouse for the Blind, the Deaf-Blind Service Center, the U.S. Access Board, FHWA consultant Toole Design Group, and the Washington State Department of Transportation (WSDOT). 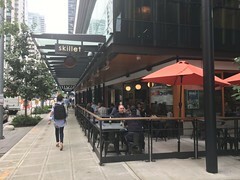 If you have any questions about accessibility within the Seattle public right-of-way, we encourage you contact SDOT’s ADA Coordinator, Michael Shaw. He can be reached at (206) 615-1974 or by email at Michael.Shaw@seattle.gov. Don’t Forget to Request your Curb Ramps! 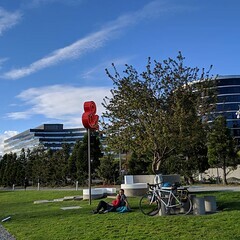 You probably know that curb ramps help people travel from the sidewalk down to the street crossing, particularly people living with disabilities and those who use wheelchairs and other mobility devices. But did you know, if you are living with a disability, you can request to have curb ramps installed at specific locations where they would assist you in your daily activities? 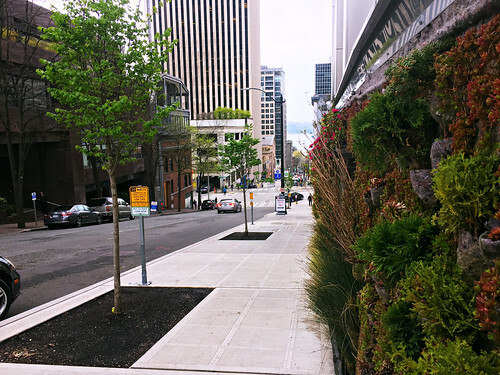 SDOT is pleased to announce that our curb ramp request program is currently being improved to help build curb ramps faster than in years past. Curb ramps are important for wheelchairs and other wheeled devices. Building curb ramps takes more time than you might think. Engineers individually design curb ramps which will work on our hilly streets and with our unique drainage issues. We also have to schedule crews to build the curb ramps. All of these tasks must occur within the confines of other SDOT projects and fiscal responsibilities. 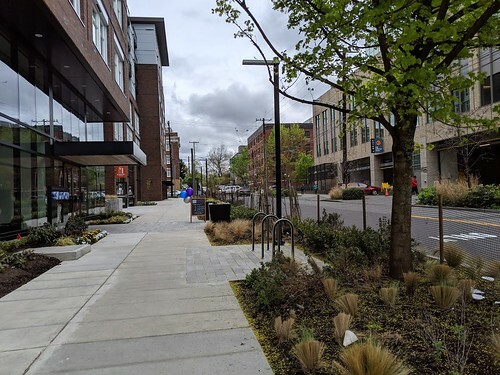 However, SDOT is developing new processes that will strive to install curb ramps within one year from the date they are requested. This requires SDOT to streamline the process and have staff ready to tackle the challenge as soon as the requests come in. We understand how important accessibility is to our residents and visitors. New curb ramps under construction. 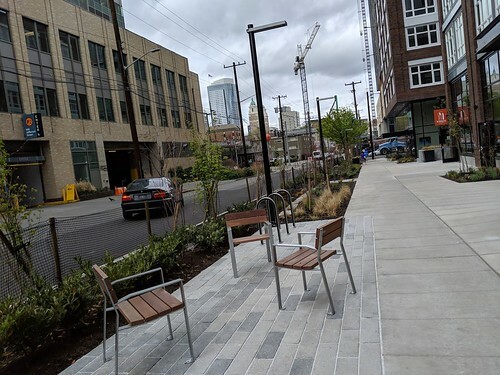 SDOT continually strives to get the word out to people about requesting curb ramps, and we are surprised to find that so many people are not aware of it. Tell your friends to visit our ADA Request webpage and fill out our online form so that we can help with your access needs! You can also request curb ramps and other improvements through the City of Seattle Customer Service Bureau webpage. 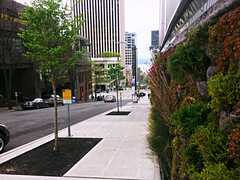 SDOT builds new curb ramps as a part of their public right-of-way improvement projects. 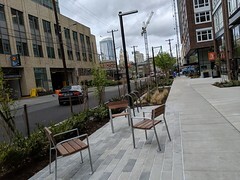 Other city departments, private developers, and utility services may also install curb ramps as a part of their projects. But we know that it is important to understand where you might need curb ramps, sooner than when a planned project reaches your area. 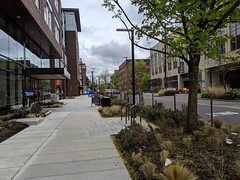 We recently completed street and sidewalk reconstruction on 23rd Avenue from S Jackson Street north to E John Street as part of the first phase of the 23rd Avenue Corridor Improvements Project and we were invited to observe a local deaf-blind person walk part of the improved corridor. Alberto Gonzales, who lives in the Central District and works at the Lighthouse for the Blind, Inc., is deaf-blind. 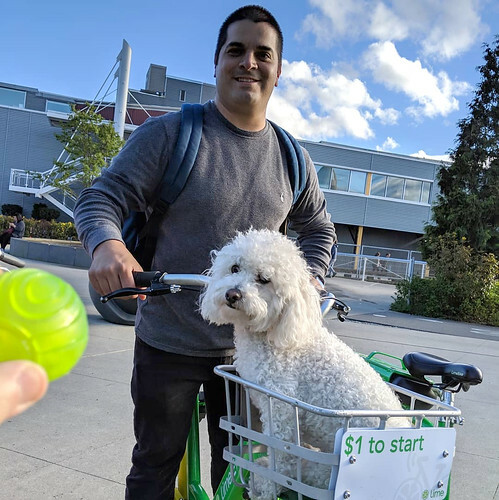 Alberto is able to get from home to work walking on Seattle sidewalks and using public transportation. He also gets help from his trusty guide-dog and uses a mini-guide to detect potential obstructions ahead. Alberto works with an area orientation and mobility specialist, David Miller, who also joined us on the walk. David helps blind and deaf-blind people learn routes and how they work and how to use public transportation based on their needs. Alberto walks on a new sidewalk on 23rd Avenue. We learned that the new sidewalks and street crossings help Alberto and others, because they are smoother and more level than before. Light poles and other infrastructure have been relocated to create the widest and most usable route possible. Alberto was able to more comfortably cross the streets because of the Accessible Pedestrian Signals (APS) that have been installed. We walked with Alberto and David on 23rd Avenue from S Jackson St to E Spring St, not too far from where Alberto lives. The improvements made walking in the neighborhood easier for Alberto, which is important to help him get to work, and also to get outside for some exercise! Alberto finds the APS pushbutton to cross the street. We participate in observations like this to help us learn more about the needs of people living with disabilities. 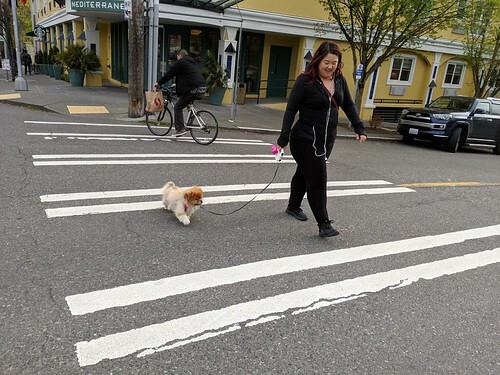 While we strive to provide the most accessible and usable pedestrian network possible, there is always an opportunity to learn more by observing people with different abilities. If you have any questions about accessibility within the Seattle public right-of-way, we encourage you contact our ADA Coordinator, Michael Shaw. He can be reached at (206) 615-1974 or by email at Michael.Shaw@seattle.gov.